Chris Brown wears Dior Technologic sunglasses in the Fun music video. Singer Chris Brown wears Christian Dior Technologic sunglasses in the music video for Fun (Pitbull). he wears the same pair in the music video for Do It Again (Pia Mia). These Technologic sunglasses have a gold wire frame and black temples, and brown gradient lenses. Find this pair on Amazon or eBay. With the same outfit which Chris Brown wears on the speedboat, he also wears a white Richard Mille wristwatch. In another scene, with the white Ferrari Testarossa, he wears a pair of Ray-Ban RB3447JM sunglasses with camo print. 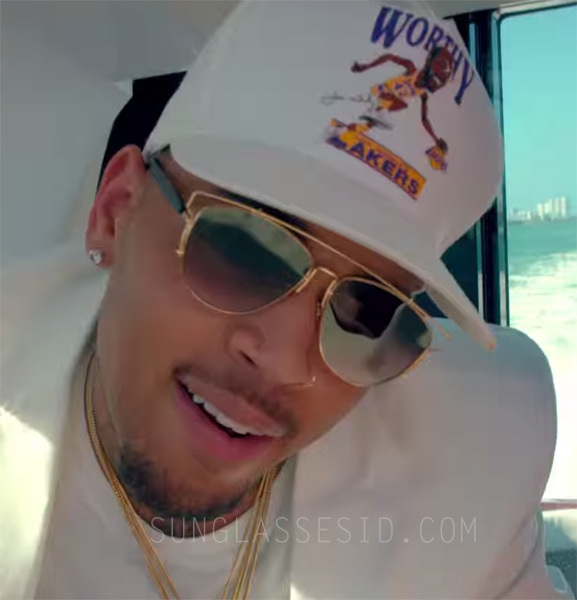 In another music video, for Five More Hours, Chris Brown can be seen with a pair of Dior So Real sunglasses.